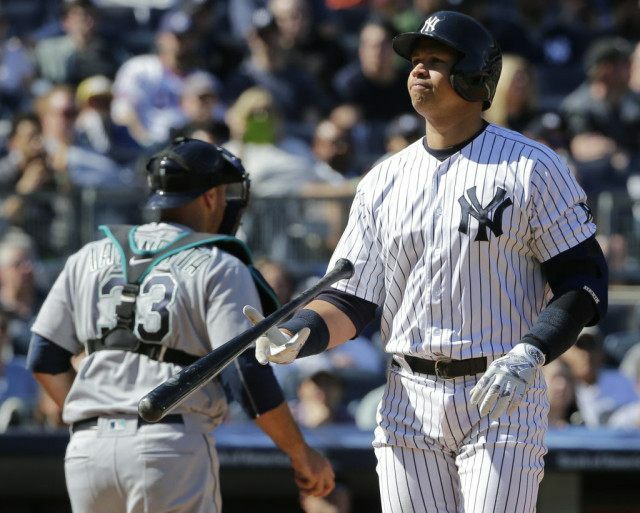 NEW YORK (AP) — Alex Rodriguez homered on the first pitch he saw Sunday, ending his hitless skid immediately after he was dropped three spots to sixth in the New York Yankees’ batting order. The 40-year-old was without a hit in his previous 19 at-bats, two shy of matching the longest drought of his career. A season after hitting 33 home runs, A-Rod began the day batting .100 (3 for 30) with one homer and two RBIs. The three-time MVP connected for a two-run shot off Seattle Mariners starter Hisashi Iwakuma in the second inning, sending an 86 mph fastball into the lower-deck seats in left field. It was the 689th home run for Rodriguez, who ranks fourth on the career list. Looking for a spark, Yankees manager Joe Girardi juggled his struggling lineup for the series finale as New York tried to stop a four-game losing streak. Rodriguez was hardly the only Yankees hitter in a funk at the plate. New York was 0 for 24 with runners in scoring position during the first two games of the series and 3 for 46 in those situations in its last five games overall. Brett Gardner hit an RBI double in the third, ending the Yankees’ 0-for-26 skid with runners in scoring position during the series. Carlos Beltran, off to an excellent start, was moved up two spots to No. 3 in the lineup. Beltran homered and matched a career high with four hits Saturday, the first time he had three extra-base hits in a game since June 2013 with St. Louis. Girardi said he spoke to Rodriguez about the decision and noted the designated hitter was moved up from seventh in the order early last year to the No. 3 spot after serving a season-long drug suspension in 2014. Scuffling third baseman Chase Headley was given a day off in favor of rookie Ronald Torreyes. Headley was hitting .154 without an extra-base hit in 26 at-bats. Girardi was asked whether he has been disappointed by Headley’s lack of production.